You've seen Greg Cravens' work on the cover of this paper and most weeks on the Flyer's editorial page. But, Cravens admits, the times when Jim Davis made bank with "Garfield" in the daily newspapers are over. Now is a time to grab at whatever opportunities present themselves. Thinking about starting a web comic? Give it a shot, just have your ideas in place first. These are just some of the things Cravens will cover in his cartooning class this Sunday at Novel bookstore. He says when he first heard that Novel was opening, he called them about placing his own books in the store. This discussion led to some brainstorming of how they could work together, hence the class, which is open to all ages. According to Cravens, all kids love to draw, but it's their parents who may be the true comics geeks. 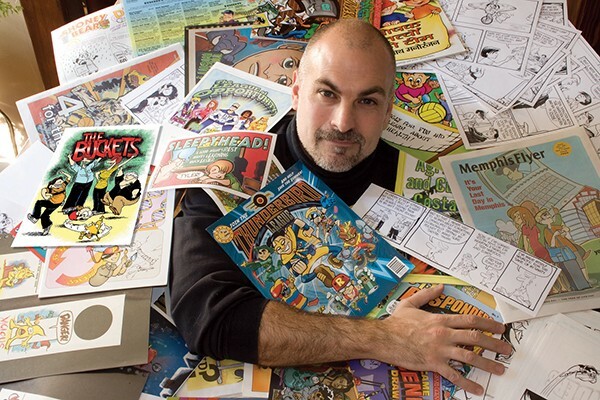 Cravens, himself, is a Mad magazine connoisseur and a "Peanuts" fan from way back. Cravens says he often has to break students of what cartooning is, that it's more than just boxes and talk balloons. He often will start them off with a circle, two dots, and a line — in other words, a smiley face. He'll ask them what that image is conveying. Happiness, they'll say. This leads to a discussion of why this is and emotional content. "Cartooning is not about drawing," he says. "It's more about communicating."